Del Marietta-Southwest is the 46th most walkable neighborhood in San Jose with 3,361 residents. Del Marietta-Southwest has some public transportation and is very bikeable. Nearby neighborhoods: Greylands, Del Mar, Barbera-Stokes, Sherman Oaks, Downing-Whitethorne, Fruitdale College and Palmar-Borello. Some errands can be accomplished on foot in Del Marietta-Southwest San Jose. Del Marietta-Southwest is the 46th most walkable neighborhood in San Jose with a Walk Score of 67. Find apartments in San Jose's most walkable neighborhoods: St. Leo's, Sunol-Midtown and East Virginia. 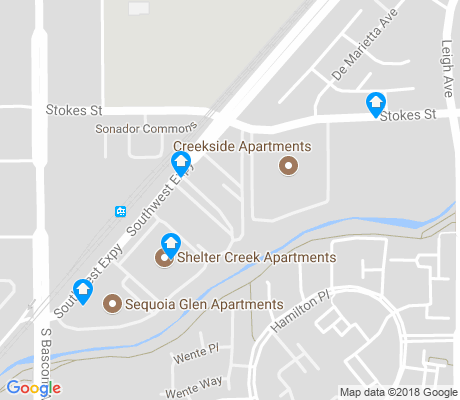 Compare Del Marietta-Southwest to other San Jose neighborhoods. Moving to San Jose from another city? There are about 13 restaurants, bars and coffee shops in Del Marietta-Southwest. People in Del Marietta-Southwest can walk to an average of 0.6 restaurants, bars and coffee shops in 5 minutes. A few nearby public transportation options. Find Del Marietta-Southwest San Jose apartments for rent near public transit. Del Marietta-Southwest has some public transportation and about 1 bus lines passing through it. The map above shows how far you can travel in 30 minutes from Del Marietta-Southwest on public transit.